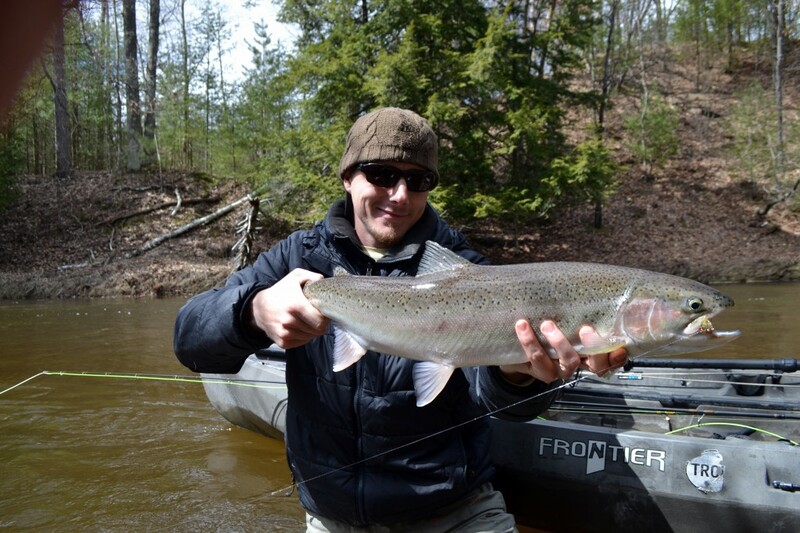 Last weekend a bunch of guys and I headed up north along Michigan’s west coast with a few small boats, way too many fly rods, a smoker, and a cooler full of meat. Exactly the way I expected to celebrate the end of my non-married life. Along the way we checked the weather forecast and stream flows to devise a plan and it was looking grim. After a good rain some cold air moved in and changed conditions from almost perfect to borderline dangerous. Michigan rivers are deceivingly swift. At first glance the water looks fairly flat and slow but once you step in up to your thighs you can feel the current start to move you down river. So, with some added rain and cold weather our first concern was safety. When we arrived we had heard that the area hadn’t gotten as much rain as they expected, and despite the cold forecast the temperature stayed above freezing and we got a good mix of sun to keep us warm, and enough clouds to keep fish active. Day one we floated our fleet of small boats from pool to pool drifting eggs and swinging streamers through likely lies waiting for THE TUG. Brown trout where caught here and there, but that’s not exactly why we traveled 6 hours. 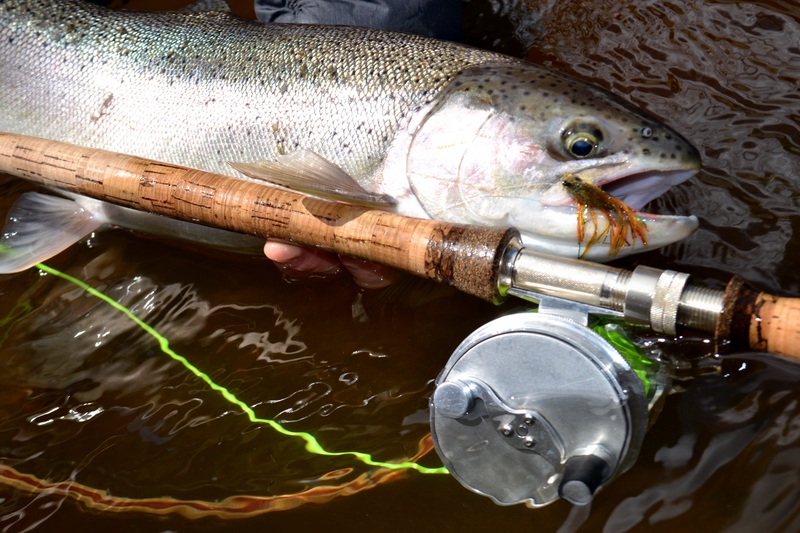 Catching a steelhead anywhere is a major feat in fly fishing. 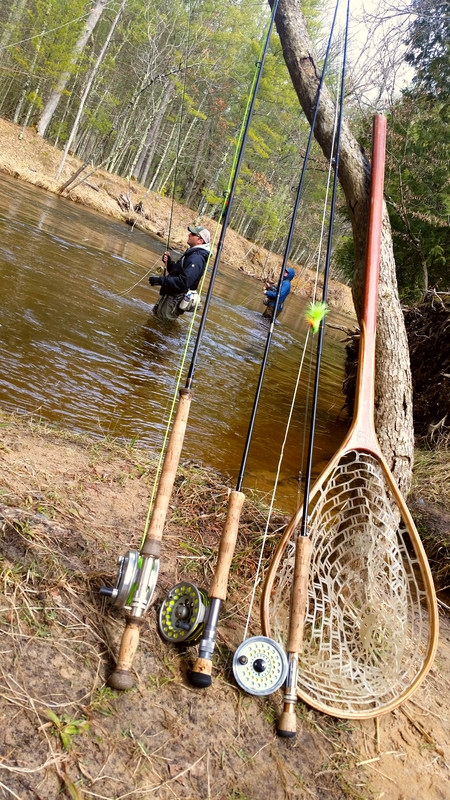 Catching a wild steelhead in a river with no dams, and littered with log jams is something that definitely requires your A-game and a bit of luck. With so many river miles and so many places to hide getting one to eat your fly is the first challenge. 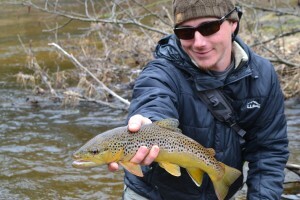 Then, it becomes a struggle to keep the fish out of the wood and trying not to let it get too far down river. When all this happens and the fish comes to the net you quickly forget about the cold, wet, fishless hours, and the victory resonates throughout your group. Everyone loves a chance to see these amazing fish up close, and this time I was the lucky one to get my hands around a fresh hen. Day two we waded in damp weather and my brother had one steelhead take an egg and then break off due to a drag malfunction when it decided to make a run. 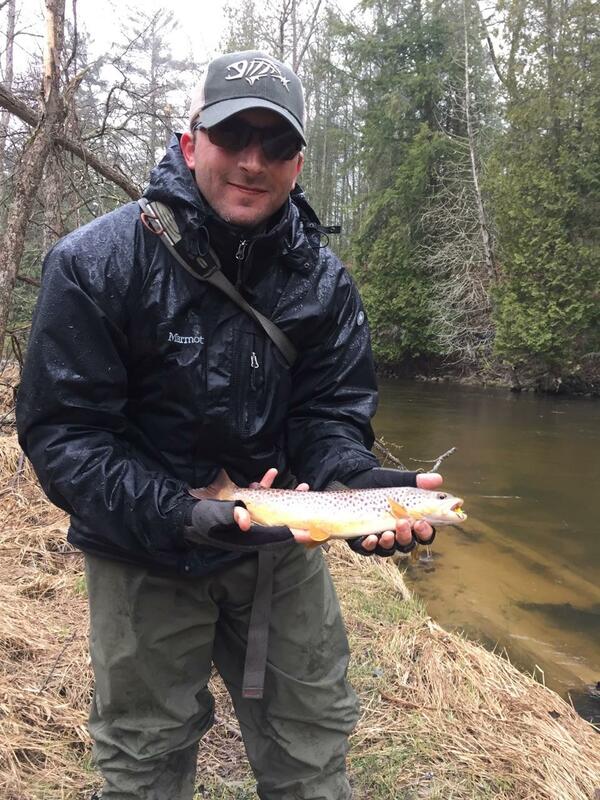 Other than that just a few questionable bumps and a couple brown trout provided some fun filler between long walks and cold beers. Adam feeling relieved to reach the bank after wading a little too deep.